A healthy bulb means a healthy plant! Looking at the size, the surface and other features will help you make sure you buy the best bulbs. When it’s time to plant bulbs like tulips and daffodils, make sure you’re buying the best ones to ensure you have a spectacular show next spring! You’ll probably have the most selection if you order online or from a catalog. Learn a few of our favorite places to buy bulbs here. But if you are shopping at your local garden center, you want to make sure you buy the best high-quality bulbs. If you closely examine the bulbs above, you may see a few blemishes, but they’re all OK. If fuzzy surface mold rubs off and the bulb looks smooth and firm, it’s probably fine, too. If the mold won’t rub off, put the bulb back. You may have to pick up several before you get a feel for this. But if the bulb feels light, it’s dried out from too much heat or being held too long in storage. Unlike a seed, a dry bulb can’t be rehydrated—don’t buy it. 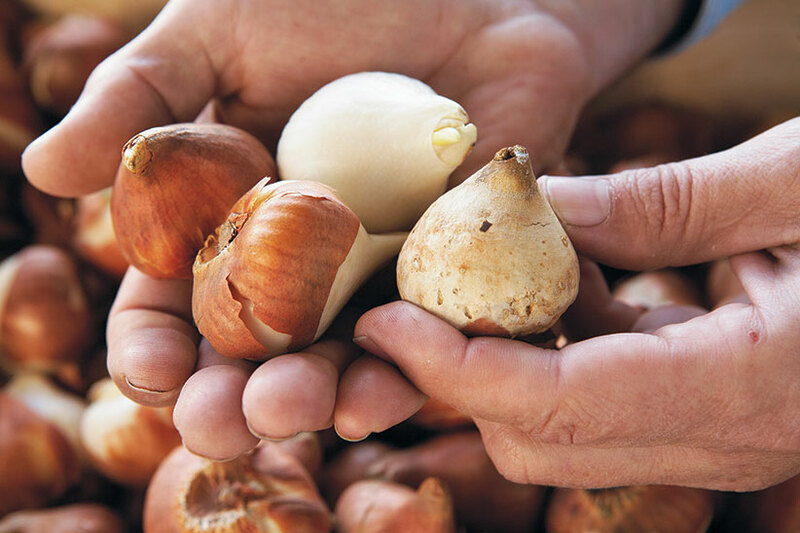 Most bulbs have a thin, dry tunic that helps keep them moist. Some cultivars have tight, snug tunics while others will fall away as they are handled. Both of the bulbs on the left side of the photo are OK to bring home. But even if the tunic is missing, the bulb might be OK. The white bulb at the back is missing its tunic but the bulb is heavy with a smooth surface, so will be fine. On the other hand, the bulb on the right has nicks and blemishes and it’s beginning to shrivel. Note the brown tip compared to the healthy bulb behind it. Don’t buy dried-out bulbs like this. They are at risk for rot and drying out. Bulbs vary in size, depending on the cultivar. So how do you know what to buy? Look for the term “top size” on the package or in the catalog description. In general, the bigger the bulb, the better the flowers next spring. However, biggest is not always best. 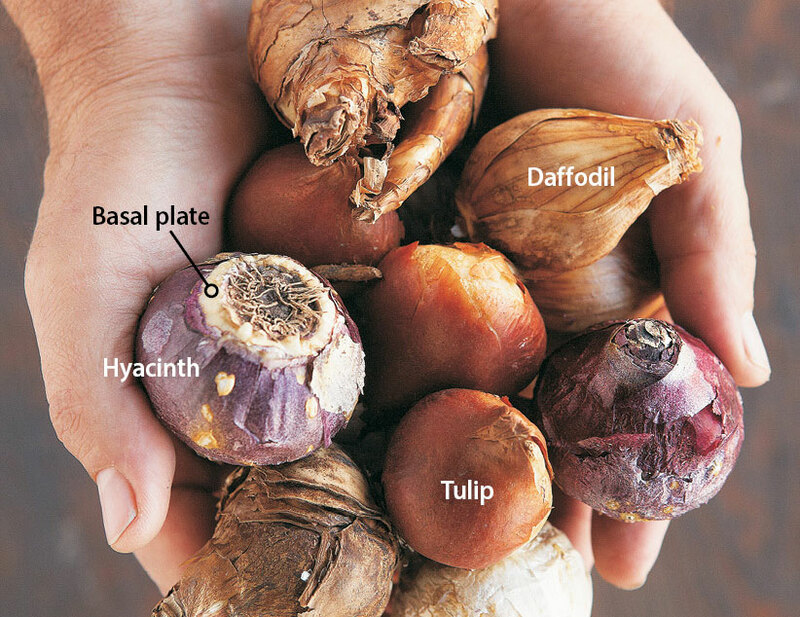 Top-size hyacinth bulbs will produce big flowers that are top heavy and bow down after a rain. For this bulb, look for the circumference, listed in centimeters. A good size hyacinth for the garden will be labeled “16/17 cm”. 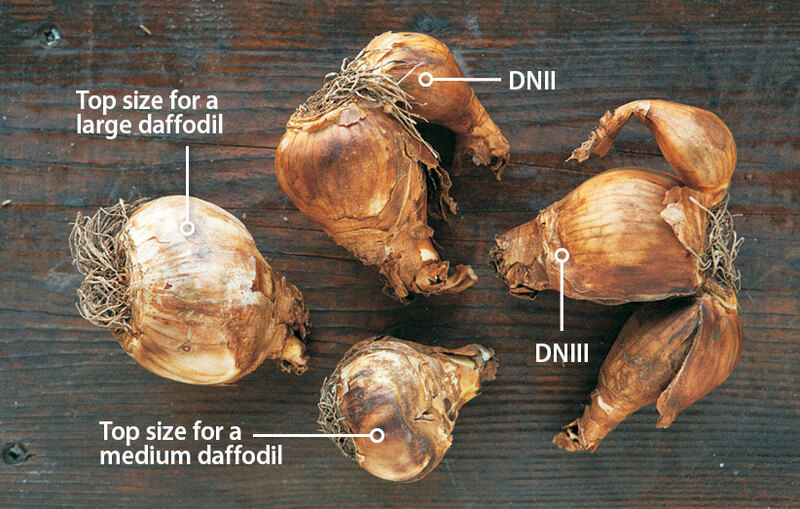 The bulbs of each daffodil cultivar can vary greatly in size. So daffodils are often listed with “DN” in the description. This stands for double-nose and tells you how many bulbs are attached together. A DNII has two flowering-size bulbs. DNIII gives you more bulbs, but not all of them may flower the first year. Have a tough spot in which you’d like to try bulbs? 12 bulbs for gardeners in every region will help you choose the right ones.